- Singular! I cannot guess the rebus in today’s Charivari! - I have it all! I must run and tell my wife. 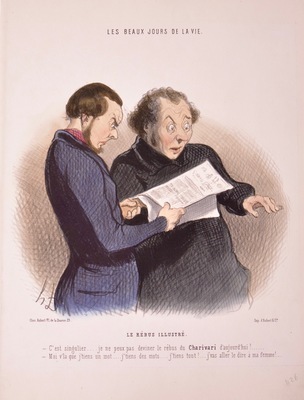 As the print suggests, Daumier’s audience took their newspapers seriously—even the less serious sections. The rebus, a puzzle composed of pictures representing words, was a popular feature of Le Charivari, the journal that published the majority of Daumier’s lithographs.